As industrial control systems (ICS) and process control network (PCN) environments become more connected, “security by obscurity” is no longer an adequate strategy. Sophisticated adversaries have begun to take notice of vulnerabilities found in today’s operational environments. 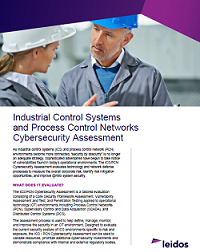 The ICS/PCN Cybersecurity Assessment evaluates technology and network defense processes to measure the overall corporate risk, identify risk mitigation opportunities, and improve control system security.